Our home in Barga has been in the family for over 100 years, and forms part of a much larger property which once played a historic role in supporting the local nobility. It was transformed from a base for their staff and animals into a silk worm producing factory, providing valuable silk threads for the fabric trade. Benefitting from a very large garden giving unparalleled views over to the Apuane Alps and down to the valley below, this is a homely, comfortable and well-loved location to spend a memorable holiday. With three bedrooms and two bathrooms (one en-suite with corner bath and shower; the other a spacious shower room), the apartment can comfortably accommodate up to eight people. The en-suite bedroom downstairs has a king size bed, with a door from the bathroom straight onto the garden. Upstairs, there are two bedrooms, each with twin beds which can also be converted into king size beds. The larger of these rooms, the family room, also has a set of bunk beds large enough to sleep two adults but of course ideal for children sharing with their parents. There is ample storage and hanging space in all of our rooms. The kitchen and living room complete the available accommodation. Whilst traditional in style, the kitchen benefits from a full size Bosch dishwasher and a large freestanding fridge/freezer. In common with properties in much of the area, the cooker is fuelled by bottled gas. A microwave and freestanding oven/grill are also available in the kitchen for your convenience. In the living room you will find a table and chairs to seat eight people comfortably for a meal indoors and a wood-burning stove to bring extra cheer on any chillier autumn nights. Outside, there is dining space under the shady grapevines for 12 or more, with several small marble tables as well as a bespoke wooden bench and table with space for eight. The garden provides lots of space to relax, to sit with a paintbrush and easel, a book or a glass of wine in hand, and to enjoy the views and the local colour. There are four loungers for lying in the sun and a range of other spots to sit in, including the original circular pergola at the end of the garden which is also home to more grapevines. A private parking garage is available and free for your use when renting the accommodation. It is accessed on the street outside the house. 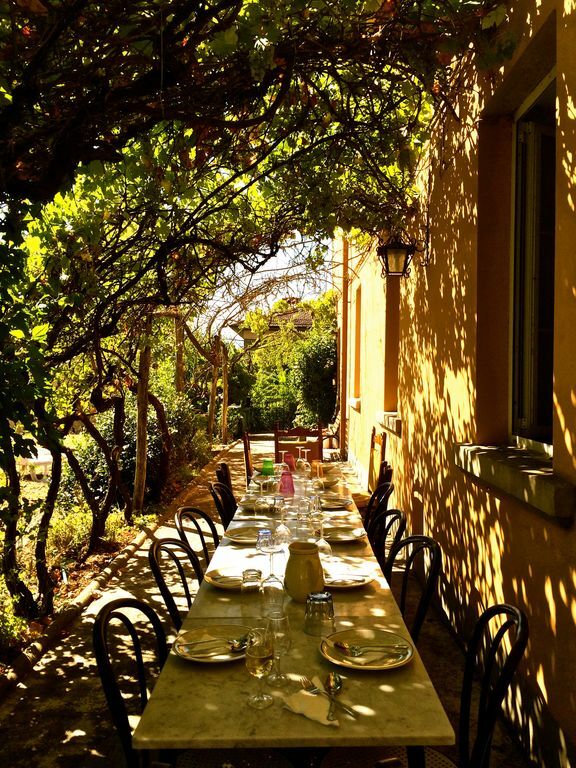 In the limonaia (the traditional outbuilding in the garden which historically protected the family's lemon trees over winter, in large terracotta pots) you will find garden equipment, the washing machine, and the wood-fired pizza oven which has been used to very good effect over the years! A marble topped preparation table and traditional steel pizza paddle with a very long handle are available for your use. Our accommodation is pet-friendly, child-friendly (with your supervision in the garden and on the stairs of course!) and gay-friendly. With our many years of experience in providing niche activity holiday experiences, we also welcome requests from potential groups of guests to assist with the planning of group actvities, including reserving additional accommodation for larger parties. Our home is not easily accessible to people with mobility problems as there are 10 steps leading up from the road and further stairs to the uppper floor. Depending on your mobility needs, the ground floor with its ensuite bedroom may be ideal. Please contact us to discuss further. Please Note: We require our guests to pay our housekeeper on arrival the sum of Euros80 in cash for cleaning and housekeeping services including linens and towels. We do this because local costs are incurred in local currency. This home has been in my family for over 100 years. I enjoyed visiting for long holidays as a child and I'm delighted to share it with guests now, who can enjoy the beautiful views, the amazing local food and wine, and the friendly atmosphere in this lively, traditional town. toilet, shower, Upper floor. Serves upper bedrooms. toilet, combination tub/shower, outdoor shower, Door onto garden. Corner bath. Vanity unit. We require our guests to pay our housekeeper on arrival the sum of Euros80 in cash for cleaning and housekeeping services including linens and towels. There are steps up from the street to the access gate. Once through the gate, there is a concrete path to the front door. The ground floor bedroom is ensuite and also has a separate door straight onto the garden. Living room and kitchen are also on the ground floor. A charming stay. The only thing that I forgot to check before booking was that there was no wifi. However, Nadia was more than helpful and showed us where to pick it up. A large spacious house...only wish we could have spent more time in the garden...next time when it is warmer!! Thank you so much for your comments. We loved having you as our guests. And we all look forward to the warmer weather! The house was extremely comfortable well located and peaceful. I loved the patio, and we sat outside every day and enjoyed the beautiful view. We were there 4 weeks, and I would go back there again. We had two sets of guests, and it was a perfect setup with them having the upstairs to themselves. It would have been nice to have had an oven, and the grass needed to be cut at least every two weeks, but overall, it was the best month of my life. Thank you so much for choosing us for your special holiday and for your very generous comments. Your points about the oven and the speed of the grass growing this summer are noted with thanks! I’m so happy that your trip worked out so well for you and it gives us great pleasure to hear that you would be happy to return. We would be delighted to host you again in future. Grazie tantissimo. Speriamo di vedervi di nuovo. We prefer to accept guests on a full week basis or more but we will consider minimum stays of 5 nights if you contact us with your request. Prices given are for a week (7 night) stay. A 5 night stay is priced at 80% of the relevant weekly rate. Additional nights on top of a 7 night booking are charged at 1/7 of the relevant weekly rate. There is an additional housekeeping/cleaning charge of up to Euros 80 for each stay (depending on the number of bedrooms required per booking), paid locally upon arrival. We are also happy to consider discounted booking rates for fewer guests (2) and special rates for longer bookings. Rental prices include bed linen and towels, utlities including gas for cooking, and a supply of logs for the wood burner. We are happy to consider longer lets at preferential rates outwith the summer season, upon request. For weekly lets in the the winter period, in common with most Italian property rentals there will be an additional charge for utilities based on electricity meter reading. We do not have central heating but provide oil filled radiators and have a wood burning fire in the living room. We will be happy to provide further details on request.